A trampoline can be a great addition to your backyard. Aside from being a fun toy for children of all ages. It also provides a way for the entire family to get plenty of exercise without even trying. There are many different types of trampolines available from simple indoor trampolines used for workout sessions. To those designed exclusively for small children to use, one is an inflatable trampoline. When it comes to the best trampolines for toddlers and preschoolers, inflatable trampolines are a great option to consider. Is an Inflatable Trampoline the Best Choice for You? Inflatable trampolines are designed with kids in mind and create a fun-filled oasis in your backyard. These setups are often very large and colorful, and some are even designed to use inside a pool to create a unique water trampoline. An inflatable trampoline is like a regular backyard trampoline. The frame is from inflatable PVC material. There are also no springs on these trampolines. And you jump using the air mattress on the inside. Water trampolines are designed the same except they have ropes to anchor them while in the pool. They also have handled in place for security. 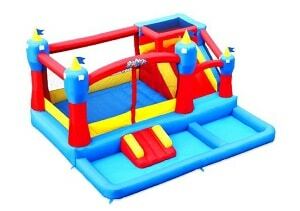 Many people choose to rent inflatable trampolines for birthday parties and other special events. They are available in a wide range of sizes. And some are so large that you would only want to have them up temporarily. 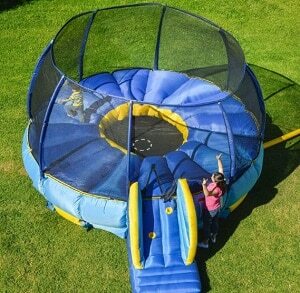 However, you can also find inflatable trampolines that are just the right size to place in your yard for everyday play. Plenty of parents recommend these trampolines for toddlers. Because they are considered much safer than traditional trampolines. And they are available in fun, colorful designs that appeal to younger kids. Here are some of the best inflatable trampolines for young children rated by customers who own them. One of the best things about the Blast Zone Crocodile Isle Inflatable Water Park is that it takes less time to inflate fully than the others mentioned here. It can easily inflate within two minutes, giving your children more time to play. The vibrant green play area looks great sitting in the backyard and is very inviting on a hot summer day. This trampoline and water park are large enough for five children to play at once. It sprays water using a blower to keep kids entertained all throughout the summer. Features include two water slides, a climbing area, and a large pool area that can be filled with plastic balls when it is not being used as a swimming pool. It measures approximately 14’ x 22’ x 8’. The deflated size of this inflatable play area is similar to a rolled up sleeping bag. The bright and colorful Intex Jump-O-Lene Transparent Ring Inflatable Bouncer is a great choice for small children between the ages of 3 and 6 years. 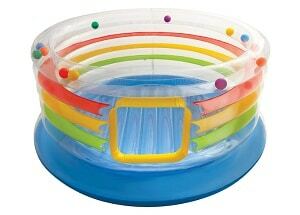 This rainbow themed trampoline features twelve colored balls that roll around the top as little ones bounce and play. There are transparent sides that help parents keep an eye on the kids at all times. There is also a crawl-through door that makes entering and exiting the bouncer easy. This strong and durable trampoline includes a repair patch kit for quick fixes. If you don’t want to use it as a trampoline, you can always convert it into a ball pit by adding plastic balls, sold separately. This product is recommended for kids between 36 months and 6 years of age. It can support up to 120 lbs. Unlike the transparent round bouncer also sold by Intex, this Jump-O-Lene Inflatable Bouncer is square-shaped and provides slightly more room than the ring bouncer. This brightly colored trampoline is ideal for jumping and playing outdoors. 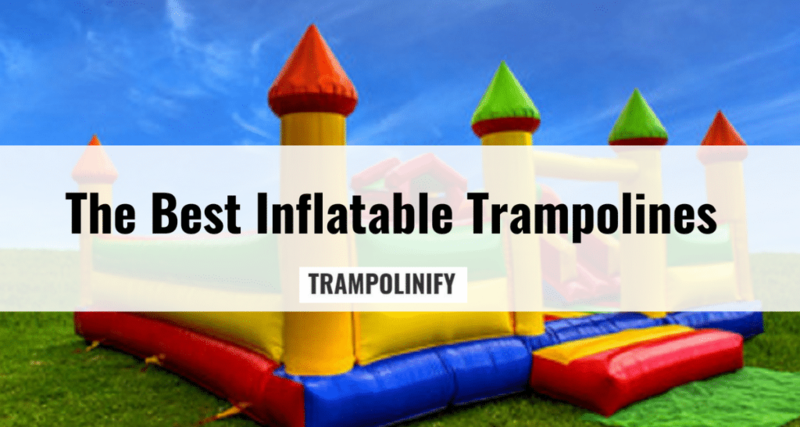 It can be used as an inflatable trampoline, a ball pit, or a playhouse. There is a large crawl door which makes it easy for kids to get in or out on their own. The Jump-O-Lene is made from strong and durable materials and features reinforced net sidewalls that offer a safe enclosed play area for your kids. 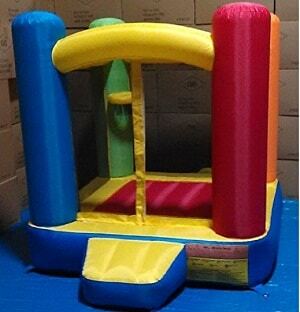 The inflated floor and high side walls make the bouncing platform perfect for toddlers and preschoolers to play on. 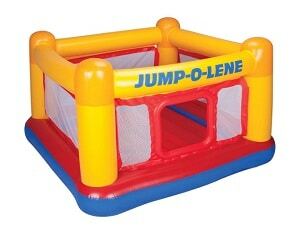 The maximum weight capacity for this Jump-O-Lene is 120 lbs. This product is recommended for children ages 3 to 6 years. The inflated dimensions are 68-1/2” L x 68-1/2” W x 44” H.
Here's A Video About "Intex Playhouse Jump-O-Lene Inflatable Bouncer Installation and Play Time with Liam and Taylor"
The Banzai Mega Bounce Trampoline is a great option for young and older kids. This large inflatable measures approximately 96"L x 96"W x 68"H. It is designed with an incredibly strong polypropylene jumping net and knotting system. The trampoline features UV resistant material so that it can stay outdoors without having to take it down each time it is used. The strong and durable construction of this toy makes it a great choice for households with plenty of kids. This product is recommended for children between the ages of 36 months and 15 years. It has a weight limit of 200 lbs. The BouncePro Superdome is a gigantic bounce house that is perfect for encouraging kids to go outside and play. It comes complete with a trampoline jump mat and an inflated nylon air bouncer, which makes it great for both younger and older kids. 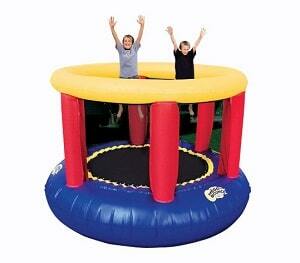 The 8’ trampoline mat is surrounded by an inflatable ring, and the total jumping diameter is 16 feet. The frame and legs for this trampoline are made from high-quality galvanized steel that is rust-resistant. Your kids will stay safe while jumping inside this trampoline thanks to the patented SteelFlex enclosure system. The BouncePro SuperDome includes an air blower for easy setup. The My Bouncer Little Castle makes a fun, colorful addition to your backyard. It is a non-toxic, puncture-resistant nylon material. It's durable enough to withstand daily use. The My Bouncer Little Castle is perfect for use both indoors and outdoors. The bouncy area measures 50” x 50” and is capable of supporting two kids at the maximum weight of 75 lbs. Each. The bouncer and ball pit’s material is in five brilliant colors that will invite toddlers and preschoolers in to play. It is easy to set up and transport from one area to the next. Inflation time takes only 60 seconds. You can deflate the bouncer, and have it packed away in less than 2 minutes. Each My Bouncer Little Castle includes a blower, storage bag, ground stakes and a repair patch kit. It may also be used as a ball pit; plastic balls are sold separately. The large Blast Zone Misty Kingdom is a great solution to boredom. Kids will love playing on this, shows as a water park. You can add plastic balls to the swimming areas and transform it into a large inflatable ball pit. The brightly colored Blast Zone Misty Kingdom measures approximately 14 x 13 x 9H. And can occupy five kids at once. An air blower is included to make set-up a breeze and inflate time takes less than 2 minutes. Once the bouncer is deflated, it can be folded into the size of a rolled up sleeping bag. 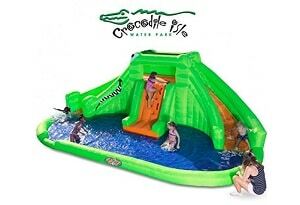 This includes a slide, trampoline area, climbing area, splash pad and ball pit. This product is made from premium materials such as high-strength x-Weave and commercial-grade vinyl for ultimate durability. This Blast Zone product comes with a Premiere Quality Guarantee. And you can count on US-based customer support for assistance. The Blast Zone Big Ol’ Bouncer Inflatable Moonwalk is one of the largest bounce houses that you can buy. This bouncer measures 12W x 15D x 7H and inflates in seconds thanks to the added blower. The max user weight for this bounce house is 100 lbs. and the max total weight is 600 lbs. It is made of strong and durable materials and the jump area is completely enclosed for added safety. 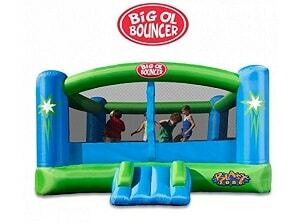 The Big Ol’ Bouncer offers twice the bounce of an 8’ jumper and is perfect for birthday parties or neighborhood barbecues. The safe slope slide allows users for easy access inside and the bright blue and green material makes this bouncer a great piece to add to your backyard. The tight opening is somewhat difficult for getting in/out. There are several things that you will need to consider before buying an inflatable trampoline. Including the environment to be set up in. There should be no sharp objects in the area that you place your inflatable trampoline. Anything that is sharp enough to puncture the material will also deflate it. Although most inflatable trampolines include a patch kit, they aren’t always effective. Plus, you don’t want to constantly apply them to the material and rely on them to keep your trampoline inflated. The best place to set up your inflatable trampoline is an open area in your backyard where there are no intrusions in sight. It is also important that you keep all pets away from your trampoline. You may not think that they will cause any severe damage. But their claws could poke a hole into the material and cause the trampoline to quickly deflate. Cats and dogs can rip large holes into the lining and cause serious damage in a matter of seconds. Therefore, you should always keep your pets away from these products. And finally, you should always make sure that you have properly inflated your trampoline before it is used. If there is not enough air, or if it is too much, you could end up busting the liner. To prevent this problem from occurring. Read the instructions and make sure that you know how to fill up the trampoline correctly before you begin. You can also watch the inflation levels to guarantee they are accurate. Doing so will help you keep your inflatable trampoline in great condition for years. Before you set up your inflatable trampoline, you will need to locate a good flat area such as soft grass. It’s important that you do not set up your trampoline on cement. Since it will increase the risk of injury. Once you have found the best place to set up your trampoline. Lay it out flat and make sure the top is smooth. The next step is to pump the trampoline full of air. If you are renting an inflatable trampoline. Make sure that the air pump works before you sign any paperwork or pay any fees. If you purchased an inflatable trampoline. It should come with its air pump that is either manual or automatic. For larger trampolines, the pumps will usually be automatic. Be sure to read the instructions if you are unsure. The pump will connect securely to the air passage on the trampoline and begin filling it with air. For most larger inflatable trampolines, it will take around three hours to inflate fully. Smaller options will take less time. The instruction manual will let you know an approximate time frame for the inflation process. To deflate the trampoline for storage. You reverse the process by releasing the air, folding it up, and placing it back in its storage case. Inflatable trampolines can be a lot of fun for kids of all ages, but if you only plan to use one for special occasions, you would benefit more from renting an inflatable trampoline than buying one. These play areas are designed for both indoor and outdoor use. However, there are many which are very large and may not fit into your home easily. This type of trampoline provides young children with a fun and space place to play. And some include special features for climbing or sliding. 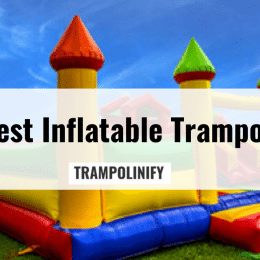 Be sure to check out our suggestions for the best inflatable trampolines on the market if you are looking for a way to encourage your child to be more physically active.